Raymond has posted lots of photos in the forum of Yao and other NBA players, including Luis Scola and Aaron Brooks, in Phoenix for All-Star weekend events. Click here for more photos of Yao and other players in Phoenix. 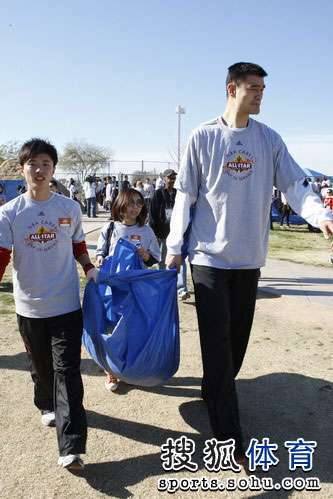 Here Yao Ming works with one of many university exchange students from Sichuan at a Phoenix school in some cleanup work as part of the NBA Cares program. Raymond has written a nice write-up of how this student was selected to come to Phoenix. This entry was posted on Saturday, February 14th, 2009 at 12:24 am	and is filed under Charity work, NBA All-Star game. You can follow any responses to this entry through the RSS 2.0 feed. There is a new rumour that Houston is going to trade for Boozer. It looks like that Houston has become a Hospital specialized to take care of seriously injured players. Illogical. YUP…..what is the use of trading away 2 players who had been contributing quietly up to 25+ points (Ron Artest + Luis Scola) for Carlos Boozer who had yet to return from his injury?? If the Rockets do that, then we can kiss this season goodbye. But the thing is no one will want a peice of washed-up garbage like Tracy McGrady.